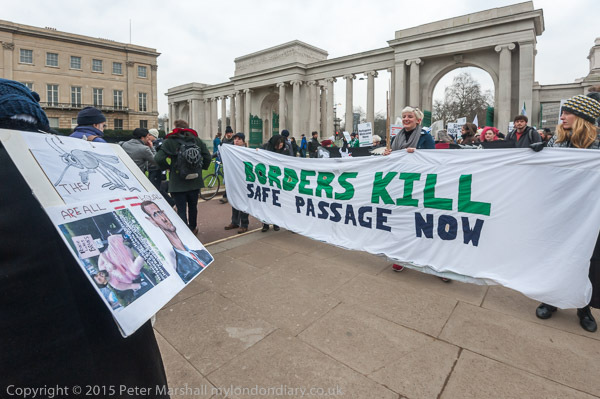 It seemed appropriate to photograph the banner ‘Borders Kill – Safe Passage Now’ in front of one of London’s larger gates at Hyde Park Corner, open when so many of the gates to Europe and between European countries are now closed to refugees. 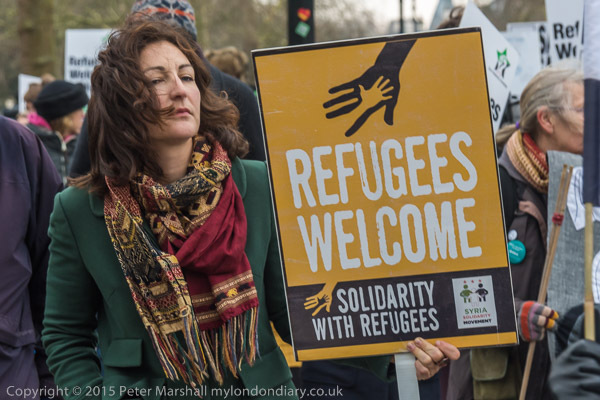 The European March for Refugee Rights was organised and supported by a number of groups, including those representing Syrians from where many of the refugees come and the many groups which have been engaged at providing practical support on the Greek Islands, Calais and elsewhere. 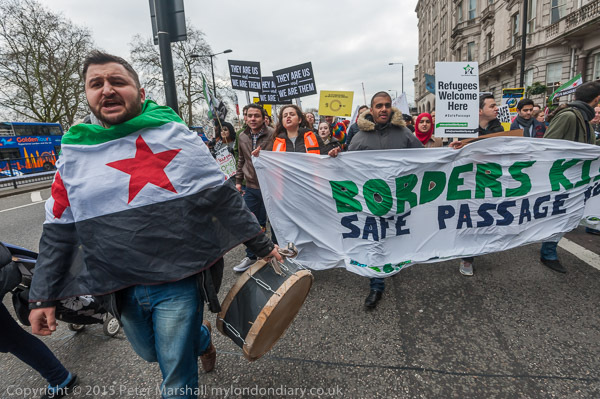 Many of those who marched had been volunteers working with refugees at these places, and they included a group of young doctors who had been volunteers with Medicins Sans Frontiers in Syria. #SafePasssage means high standards of reception and asylum in all European countries, no longer diminishing the rights of asylum seekers and refugees, allowing refugees to keep their belongings, allowing them to be reunited with their families immediately and providing stability as far as their right of residence is concerned. These people are running away from war, persecution and starvation. But Europe is looking the other way – a death count in the Mediterranean Sea of 360 men, women and children in January 2016 and appalling conditions in refugee camps like Calais and Dunkirk speak for themselves. 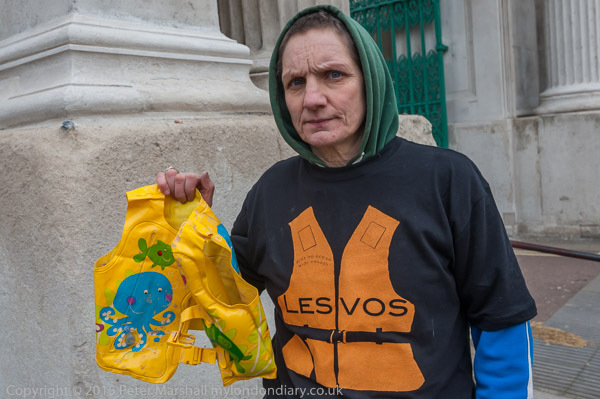 One woman who I’d photographed at earlier protests was wearing a ‘Lesvos’ t-shirt with an image of a life-jacket on it, and held up a small child’s jacket with a cartoon octopus and fishes on she had brought back that had been worn by a child arriving there from Turkey, fortunate that it had not been tested on the journey as it looked more of a fun beach item than a serious life-saver. 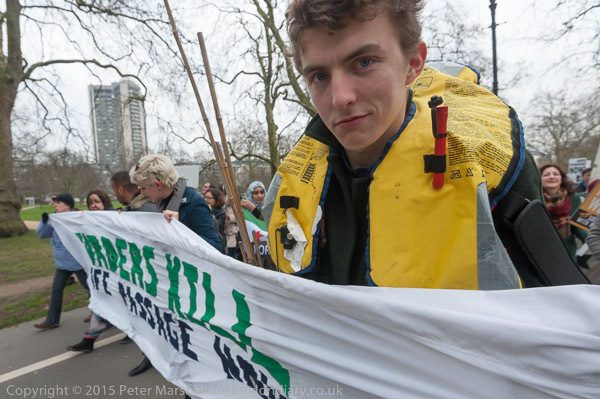 Others too wore more serious life-jackets on the march. It wasn’t a huge protest – a few hundred people – timed to be on the same day as other larger protests in cities across Europe, but unfortunately clashing with a long -planned march in London against Trident by CND, Stop the War and others which was supposed to be starting from Marble Arch. 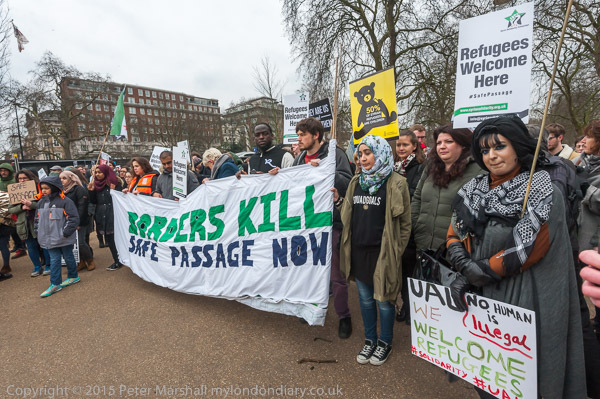 They marched through Hyde Park to Speakers’ Corner, where they held a short rally, and then went many of them went to find the front of the Trident march, which turned out to be close to where they had started at Hyde Park Corner at the west end of Piccadilly. When they tried to walk past to the front of the Trident march, the Stop the War stewards objected and tried to hold them back, but they persisted, and eventually they made their way past to march down Piccadilly towards Parliament, with the stewards holding back the main march for around ten minutes to create a gap between the Refugee March and Stop Trident. This entry was posted on Thursday, October 20th, 2016 at 02:35 pm and is filed under My Own Work. You can follow any responses to this entry through the RSS 2.0 feed. You can leave a response, or trackback from your own site.